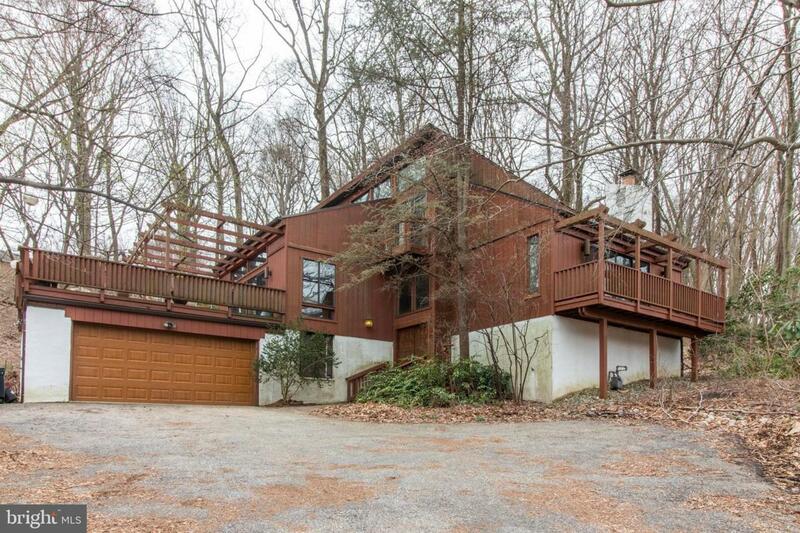 Beautiful, secluded mid-century contemporary home. Situated on over an acre and surrounded by a wooded backdrop to make you feel miles away from the hustle and bustle of everyday life. This multi-level home opens into a 2-story foyer with ample light. Head up a short flight of stairs where you will find an eat in kitchen, formal dining room, living room, and family room. The living room has access to a large deck for entertaining and relaxing. This floor is finished off by a half bath and laundry room. Go up another level and you will find 4 generously sized bedrooms. One bedroom has been converted into a walk-in closet but can be converted back into a bedroom. The master bedroom boasts an en-suite bath and ample closet space. There is also a full hall bath included on this floor. The basement is partially above ground and has access from the foyer. Enjoy this large space that can be used as a gym, recreation room or in-law space. There are additional storage rooms and access to the 2 car attached garage from the basement for ease of living. This house is a dream for enthusiasts of mid century modern and should be seen in person. Schedule your private showing today!